Note – If you are interested in reading a description of the course please click The Time Trial. Yesterday was my 2nd half marathon. My husband, parents and I spent the night in Gettysburg which made for a lot less rushed morning as I only had to walk a few hundred feet out of the hotel room to the start line. The weather was as close to perfect as anyone could ask for to complete a race. It was close to 50* at the start but knowing it would warm up to near 70* as the morning went on I went with my usual tshirt and shorts. I was a little unsure of where to lineup as I expected them to have signs indicating pace times. I didn’t want to be too close to the front and get caught up in a fast pace nor did I want near the back where I’d exert a lot of effort to get around people. I wished my dad and running buddies good luck and settled in a few rows behind them. The race was chip timed so after the gun went off I did my best to start my Garmin watch as soon as I hit the actual start line. My original goal was to run the race faster than 2:08 since that’s what I ran during the time trial. I knew if I kept all my miles under 10 minutes that would be reasonable. The first mile was typical of a large race with runners weaving in and out to pass people and settle into spots. I did my best to go out at a solid pace but despite an uphill grade I still ran the first mile faster than I had originally planned, a low 9. The second mile was even faster, a sub 9. I felt really strong and relaxed but did not want to risk burn out that early in the race, so I worked to back off the pace slightly. There were several runners around me whose breathing was literally grating on me. One person’s sounded like they were saying “Help me” in a low breath while another’s sounded like a horse whinnying. I was grateful when I finally got far enough ahead of them to no longer hear the sounds. As we entered the East Calvary Fields (part of the Gettysburg battlefield) I was entertained by the various signs that were posted along the course. Sayings such as “Remember you paid for this” and “Run person I don’t know run” made me smile. Every aid station was well organized with volunteers handing out water and sometimes Gatorade as well as port-a-potties. Despite feeling as if I could pee (I blame race jitters/being chilly at the start) I was fortunate in not needing to use those at any point during the race. There was only one true viewing spot for spectators located at a church along the course, but it seemed that there were a least a few people at each intersection to cheer the runners on. Going into the race I expected the most challenging part to be miles 6-7. It wasn’t that bad though as watching the runners coming back from the turn around spot made it fun. I cheered on my dad and running buddies as they passed. Seeing them though made me think the actual turn around spot was closer than it was; it seemed as if the road was never ending until I reached that point. Knowing I was halfway I focused on reaching miles 8 and 9 as they are always my mentally challenging miles. Twice the course passed farms with cows and their moo-ing made me feel as if they were cheering the runners on too. My mile times fluctuated but all stayed at a 9:30 or faster. I only ever glanced at my watch when it beeped with each mile. By mile 8 I had decided when I reached mile 10 I would look at the overall time and do the math to figure out what time I could expect to be finished. Mile 9 felt rather long and I was anxious for the upcoming aid station. Up until that point I had only drank water at each station but I knew Gatorade would be best to keep powering me through the rest of the race. Mile 10 became the turning point in the race for me. My watch beeped and I looked at my current overall time – 1:31. I had only a 5k left to run and as long as I ran it in less than 29 minutes I could break 2 hours. I knew I could do it but that I would have to race the last 3.1 miles very smart. By that point the bottom of my right foot was slightly burning and I anticipated that a blister might be forming. I didn’t want to pick up the pace too much too soon but I knew I couldn’t afford to back off either. This part became the true mental challenge. I knew physically I would be able to finish the race but to get the time I wanted I had to coach myself through to the end. I told myself to open up my stride on the downhill portions, maintain the pace through the flat part and keep driving strong on the uphill grades. The long grade to the final aid station was a true challenge. I was nervous about losing time and kept fighting to keep the same pace. I kept saying in my head “This isn’t Blymire, this isn’t Blymire” (Blymire being a very long hill in my town that is part of my regular 6 mile loop). I had toyed with the idea of skipping the last aid station as I would have only about 1.5 miles left to run. My body needed the hydration though and mentally I felt it would give me a boost. I almost choked on the Gatorade but kept pace through the aid station and was grateful I had utilized it. The final uphill grade I began singing a Breaking Benjamin song in my head to distract myself. The last half mile was a downhill grade and I opened my stride a lot though I didn’t fly down it nearly as fast as I had during the time trial which made me a little nervous knowing I was so close in terms of time. In high school cross country I was always known for my sprint to the finish; it was rare anyone would ever beat me in a final all out sprint. I did not have that kind of energy approaching the finish line but I did drive harder. As I saw the time clock showing 1:59 I began smiling bigger than probably any other runner in that race. I think I even teared up but with the sweat on my face it was hard to tell. I crossed the line with a grin from ear to ear and proudly accepted my finisher medal from the volunteer. My mom and husband had rushed to pull out their phones to snap pictures as my dad told them to not expect me until around 2:05. My dad brought me a cup of water and I attempted to walk around to not cramp up, but ultimately had to sit for a little as I was starting to see spots and feared passing out. I’m sure it was low sugar and my dad brought me a cup of Gatorade and a banana. After doing some light sit-down stretches I was able to get back up and moving. My final chip time was 1:59:09 and the gun time was 1:59:27. We listened as they announced the overall winners (the first female ran a 1:28!) and then age group winners. Our friend Todd placed 2nd in his age group and another friend, Armand, placed 2nd in his as well. Awards were only give to the top 3 in each group but my dad finished 5th in his and I finished 10th in mine. The hotel did not require us to check out until noon so we had time to go back to the room and shower before making the drive home. I was tired and hungry most of the day after the race but the strongest emotion I felt was pride. I had trained hard and gained speed that I don’t think I even knew I had until I was racing. I give credit to my running buddies – my dad, Todd, Armand and Scott – who helped me along the way with advice and faster runs to push me. I thank my husband who spent most Sunday mornings the past 3 months alone while I completed my long runs, but who always had a green smoothie ready for me after and who texted encouragement every time I texted him with my miles ran and times. I also thank him as well as my mom for tagging along to Gettysburg for the race. 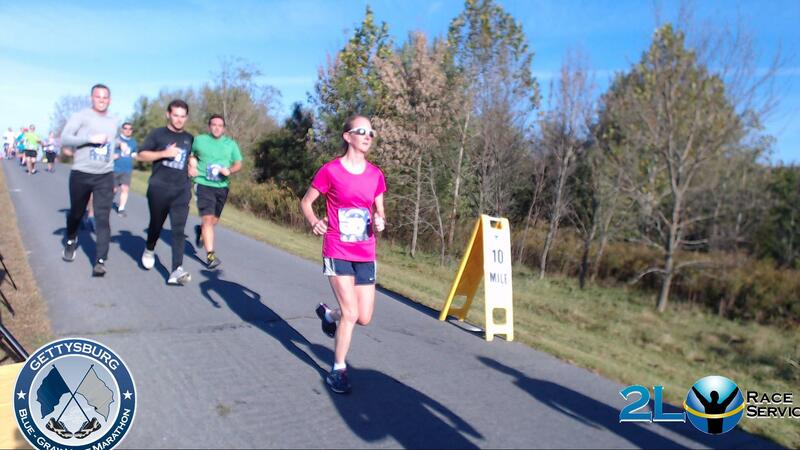 The Blue-Gray half marathon is a wonderful course with great organizers and volunteers. It is a race for any runner who loves history, rural scenic routes or who is looking for a manageable first half marathon. It was certainly my kind of race and it’s very possible that I may be running it again in the future. For now though I will enjoy eating anything I want, foam rolling the sore spots and completing some runs Garmin free. 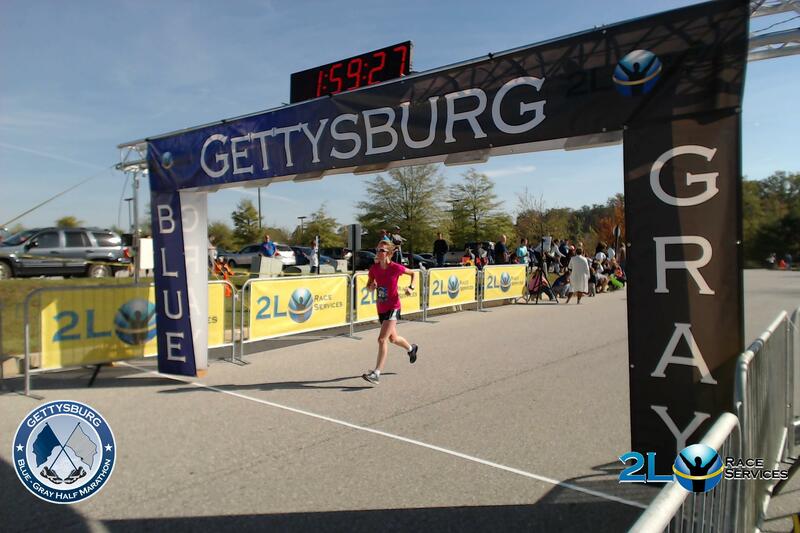 This entry was posted in Running and tagged 13.1 miles, Blue-Gray half marathon, Gettysburg, half marathon, long distance running, Running. Bookmark the permalink.